By watching this construction video tutorial, you will be familiar with some features which are very crucial for designing the structure and finding out the depth of foundation. Types of soil upon which the foundation will be built. It ranges from – clay, sand, silt, peaty, saline etc. Local corrosion of soil because of storing of water. It is mainly found in hill areas. 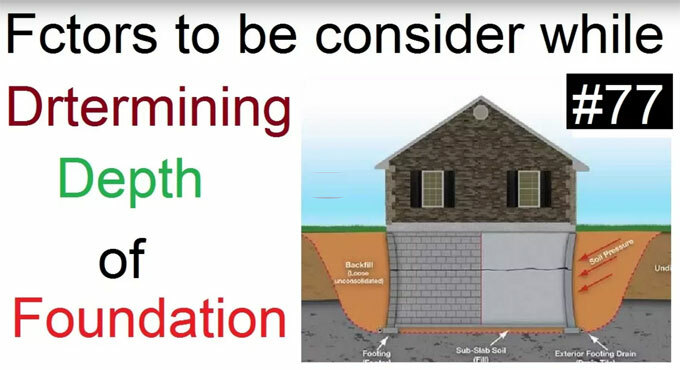 Stability of foundation mainly depends on the capacity of soil to absorb water due to heavy rain fall. Depth of frost penetration – It means the transition of the freezing front into the ground throughout freezing.